It’s been a long time since I’ve posted any of my sewing projects on BurdaStyle or one of my blogs, so finally, here are a few of my latest favorites! The first project is from last spring (See? It really has been a long time!). It was just a quick project using a bit of lacy material that I spotted on the way to the Fabricville cash register and pounced on. I got home and abandoned all my more carefully picked fabric on the floor and set to chopping into (without washing…eeek!) my spontaneous choice. I used an old McCall’s pattern (M5890) as the base and made numerous fit adjustments so that it wouldn’t look like the sack that my previous attempt at the pattern turned out to be. My final ‘inspired’ touch was to add a little lace strip to the CB collar to insure the draped front panels would fall in a consistent manner. It turns out that this is the most worn sweater in my closet – it’s never too cold and never too hot because it comes with its own ventilation system – PERFECT! More recently, I sewed up a wearable mock up and a proper version of Tasia’s wonderful Cambie Dress pattern from Sewaholic Patterns. I love how both of them turned out! 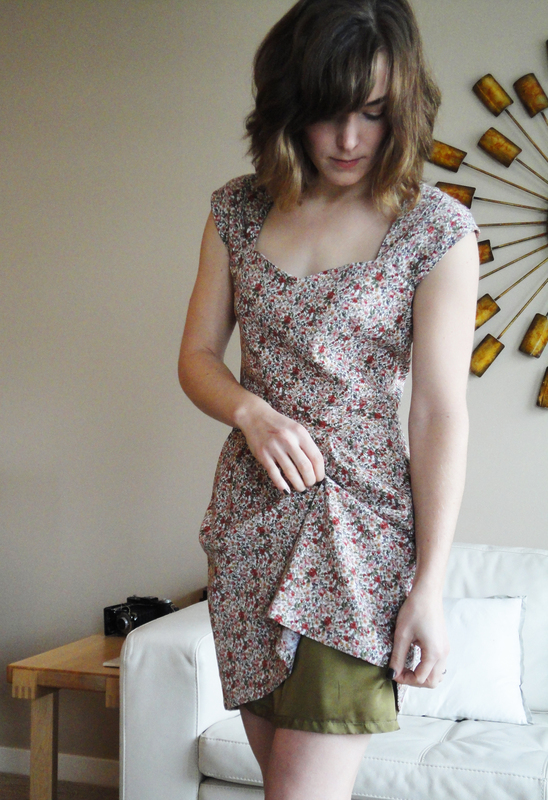 The mock up was made using a $2 sale suiting material which is a little heavy for the pattern but still worked out well. I kept this version the length the pattern intends which is maybe a little long for a short-legged girl such as me! I learnt a few things with the mock-up: The shoulder straps had to be angled and shortened (which I did slightly in the mock up but exaggerated in the final version) to make the neckline narrower to fit my chest. Also, it is a good idea to use the same fabric as lining for the bodice as it is likely to roll a little along the neckline due to the order of the construction process (there doesn’t seem to be a good time to add understitching to the neckline). Neither of these points are a critique of the pattern because Tasia has done such an amazing job coming up with a clever method of construction that makes every step simple and makes customizing the fit through little adjustments of the sleeves incredibly easy! I also love sewing her slant pockets because she has managed to simplify the standard steps of creating this sort of pocket quite a bit. I’ll be using her version whenever I need to create slant pockets in the future! For my final version I made the changes I came up with during the mock up and I also interfaced the bodice front because the rayon I used was silky and had a lovely drape. I wanted to ensure, in every way possible, that the neckline would be stiff and smooth. I somehow managed to have extra fabric at CF of the skirt when sewing it to the waste band (this wasn’t an issue during my mock-up so maybe my rayon stretched?) so I made a little pleat near each pocket which adds a bit of fullness to the front of the skirt which I’m actually quite pleased with. Both dresses have become a staple of my wardrobe – I love how they cover the shoulders and I also love the fit – the dress feels loose and comfy while wearing it but it gives the appearance of being quite fitted. The shortened hemline of the final dress looks cute with tights and I hope, when summer comes and I’m not so pasty, it will be comfortable and cool to wear on its own in the sun! Lastly, here is a project that I completed for school (The Pacific Design Academy, Fashion Design Program in Victoria). 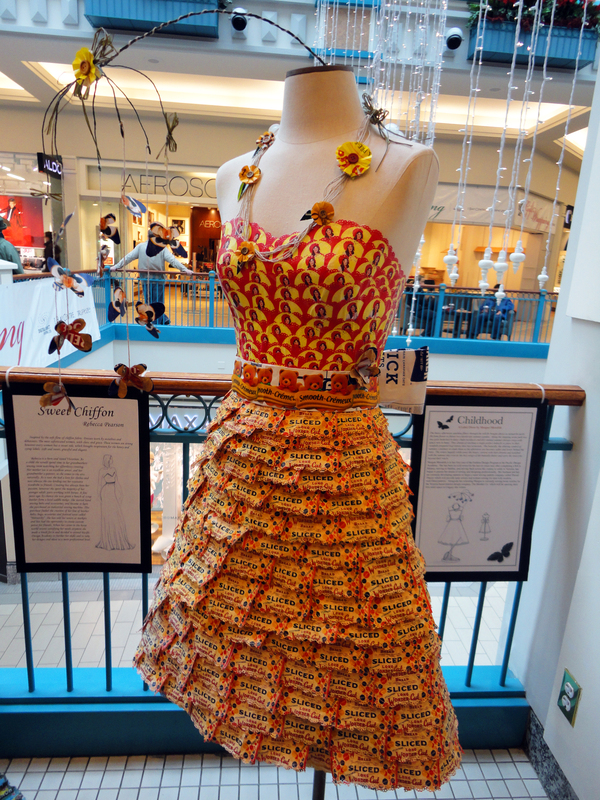 We were asked to create a dress entirely out of food labels that reflected the values of the Mustard Seed Foundation. Our dresses were displayed in the local mall throughout the Christmas Season and the public could vote for their favorite by making a donation to the Mustard Seed. My dress was called ‘Childhood’ and was meant to reflect a nostalgic view of what it means to be a child. I wanted to show that every child deserves to look back on their youth with this feeling of happy nostalgia. I used staple ‘snack’ products that, if donated to the foundation, would provide children with the sense of care and safety that the routine of eating an afternoon snack (and being regularly fed) creates. Categories: Friday Posts, Morgan's Sewing Projects | Tags: fashion, label dress, lace, M5890, McCall's, mustard seed, Pacific Design Academy, Sewaholic, sewing, Tasia | Permalink.